When I moved to Portland in 1996 I was determined to make time in my life for something creative. I had been a batik artist in the late 1960s and early 1970s until I started to work full time in a medical office. I had not realized when I took the position, how working as an artist was a full time job. Even when I was not in my studio, my mind was always noticing shapes, textures and colors of everything around me – giving me inspiration for my studio work. My stressful job took up too much space in my head and I gradually dropped my artistic endeavors. Before moving to Portland I had never painted on paper. I was attracted to watercolor because the process of layering colors reminded me of the batik technique of repeatedly dipping fabric into dyes building up layers of colors. 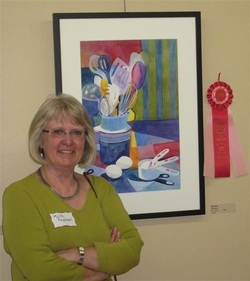 I enrolled in watercolor classes at Portland Community College and was immediately hooked! Since then I have taken a series of classes and workshops to develop my skills. I am an active member of several critique groups that have been especially helpful in teaching me more about the elements of color and composition. After living on the East Coast for 30 years, I am delighted to be in the Pacific Northwest. My love affair with Portland and Oregon has served as an inspiration for many of my paintings. Traveling abroad has also provided subject matter for my paintings. I found I am especially drawn to painting people I encounter when visiting other countries.